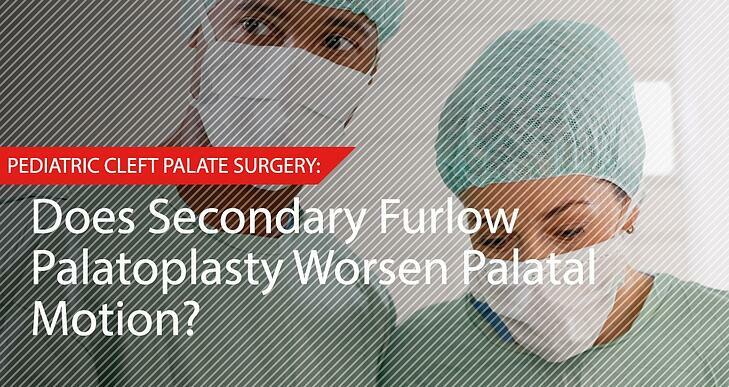 Does Secondary Furlow Palatoplasty Worsen Palatal Motion? » Does Secondary Furlow Palatoplasty Worsen Palatal Motion? A widely-accepted technique for primary cleft palate repairs, Furlow palatoplasty is also used for secondary repairs to treat complications such as fistula development or persistent velopharyngeal insufficiency (VPI). However, due to its potential to misalign and scar soft palate musculature, concerns have been raised that secondary Furlow palatoplasty (following a successful primary palatoplasty) can have harmful effects on palatal motion. The following study uses postoperative nasopharyngoscopy videos to compare palatal motion, and related muscle function, following primary and secondary Furlow palatoplasty. For this retrospective case series, medical records were obtained from patients in an urban tertiary pediatric otolaryngology practice who had undergone either primary or secondary Furlow palatoplasty over a four-year period. Subjects were randomized to one of two groups, and two blinded reviewers assessed soft palate motion as was recorded on postoperative nasopharyngoscopy videos. The primary outcome measure was the mean palatal motion score for each subject (composite score range, 0-2), generated using a modified Golding-Kushner scale to assess velopharyngeal function. Two subunits, namely the right and left hemisoft palate, were examined; the score for each subunit ranged from 0 (no motion) to 1 (normal motion to the midline). The study was powered to detect a 25% difference in mean palatal motion scores between the two groups. Twenty (20) patients, ranging in age from 12 months to 22 years at the time of postoperative nasopharyngoscopy, were included in the study. Twelve had undergone primary Furlow palatoplasty (primary group), while eight had undergone secondary Furlow palatoplasty (secondary group). Mean palatal motion scores were similar between the primary and secondary groups: 1.61 (range 0.5-2) vs. 1.53 (range 0.75-2), respectively. In other words, no significant difference in postoperative palatal motion scores was observed between the palatoplasty groups. When examined in isolation in this study, primary and secondary Furlow palatoplasty procedures resulted in similar degrees of postoperative motion of the soft palate. Secondary Furlow palatoplasty did not appear to worsen palatal motion. These findings suggest that there is, at most, a minor difference (if any at all) in postoperative palatal function among patients who have undergone primary Furlow palatoplasty or secondary Furlow palatoplasty of a previously repaired cleft palate. These results align with those of other recent studies. Although double-opposing Z-plasty repair was first introduced as a means for performing primary palatoplasty, multiple studies have subsequently demonstrated the procedure’s efficacy when used for secondary, or revision, repair. Following secondary Furlow procedures, patients were found to have either unchanged or improved velopharyngeal competence and/or speech intelligibility. This study had several limitations. Due to small sample size, the study was insufficiently powered to uncover minor differences in palatal function. The Golding-Kushner scale used to measure outcomes is both subjective and associated with inter-rater variability. Finally, the postoperative clinical status of each patient was not fully evaluated. Studies with larger sample sizes are needed to detect smaller differences in palatal motion and function between the primary and secondary groups. Future studies could also use speech analyses and quality-of-life surveys as tools to provide a more thorough assessment of post-palatoplasty clinical outcomes. Rudnicki, PA; Tsang, C; Vecchiotti, MA; Scott, AR. “Palatal Motion After Primary and Secondary Furlow Palatoplasty.” JAMA Otolaryngol Head Neck Surg 2017; 143(2): 111-115. doi: 10.1001/jamaoto.2016.2783. Published online October 6, 2016. Accessed March 13, 2017.